6th : A parish garage sale raised over $700. See photo’s of the sale in our photo. gallery. 1th : The final Caversham Lecture for this year was presented. Visit the Caversham Lecture Menu for details and to view video of selected 2018 lectures. 9th : Our parishioner and deacon Brian Kilkelly was Ordained a Priest. We have pictures of Brian’s Ordination in the photo. gallery. 10th : Brian Kilkelly was ordained a deacon at a special Service this morning. We have ordination photo’s in our photo. gallery. 19th : See the traditional shared meal of Pentecost from our 2018 celebration, held today. 9th : Check out photo’s from a typical after-Service social gathering held after today’s Evensong and Benediction. 29th : We have photo’s of today’s AGM in our Photo. Gallery. 31st : We celebrated the Easter Vigil. 31st : We said farewell to Buster Sinclair prior to he and Lesley moving out of town. Watch the Vicar farewelling Buster in our YouTube channel. 28th : Sir David Moxon’s 2017 Caversham Lecture attracted perhaps a record audience. A video will be available shortly. 26th : Former Archbishop Sir David Moxon celebrated at the Feast of Christ the King. Watch the highlights on our YouTube channel. 21st : Associate Professor Rachel Zajac delivered her 2017 Caversham Lecture. Watch how wrongful convictions can happen here. 19th : Parish mission partner Jonathan Hicks visited. See the Hicks Family visit in the Photo. Gallery. 12th : We held a special Service to commemorate the parish’s war dead. Watch our 2017 Armistice Day Service now. 7th : Professor Andrew Geddis kicked off our 2017 Caversham Lecture Series. Watch the video here. 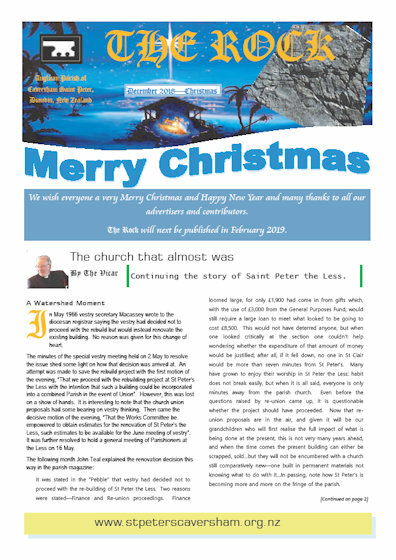 The Pebble is published weekly, with details of the week’s services and other activities. 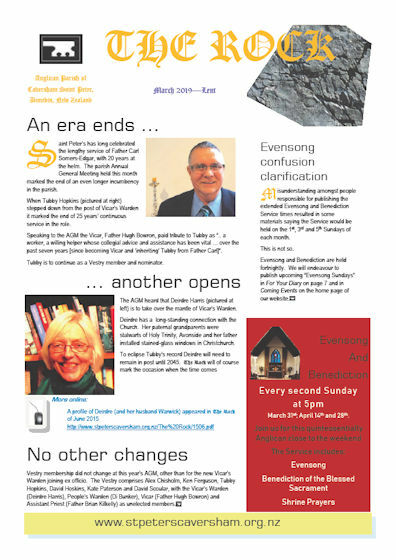 The Rock is published each month and includes news and opinion from our parish and the wider Anglican community. To access The Rock or The Pebble online, your computer needs an Adobe Acrobat Reader, which you can download from here. The Rock and The Pebble open in this window. To return to this site, please use your browser’s back button. During renovation of the vicarage, bound copies of Parish Magazines from past decades were rediscovered. We have commenced a project to digitise these and make them available on this web site. 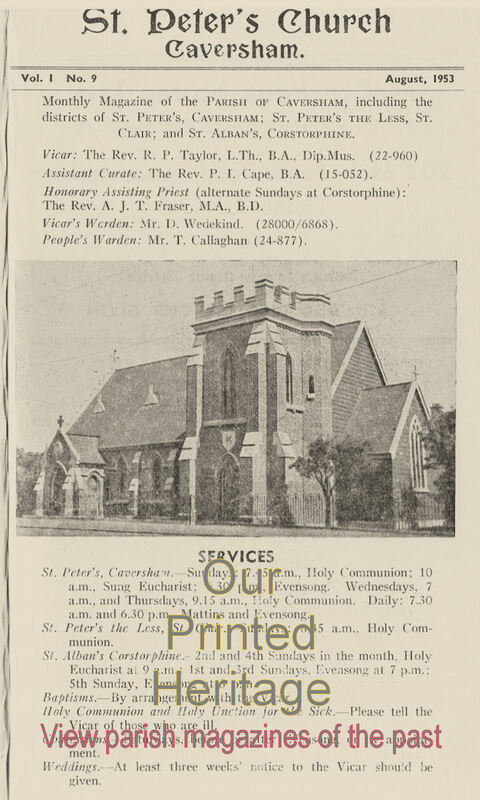 Our online Printed Heritage pages have been introduced with digitised copies of Parish Magazines from December 1952 onward. 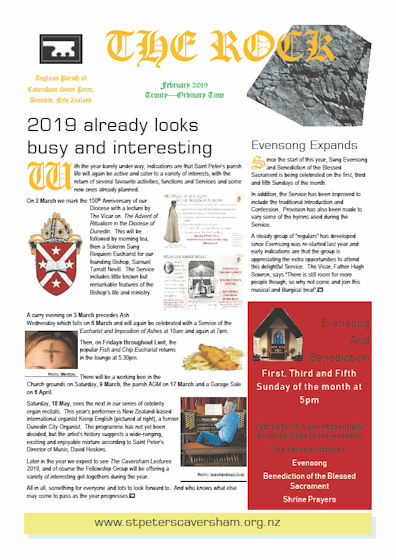 We add further editions each month along with The Rock, so you get two magazines each month, one from this year and one from about half a century ago.